A dispatch from SAALT’s New Jersey Outreach Coordinator, Qudsia Raja, on state and local enforcement of immigration laws and what it means in NJ. As advocates and communities nationwide mobilize to campaign for more just and humane immigration laws in the US, New Jersey residents prepare to cope with the actualization of tentatively discriminatory mandates that will, if put into place, adversely affect the immigrant community in the state. 287(g), a federal immigration program initiated by Immigrations and Customs Enforcement (ICE), allows for local law enforcement agencies to go beyond their call of duty of enforcing local and state laws by additionally allowing them the liberty to enforce federal immigration laws. Earlier this year, several counties in New Jersey, including Morris, Hudson, and Monmouth Counties, applied to become a part of the 287(g) program. Morristown was approved for the program last month, and Mayor David Cresitello has every intention of signing onto the program, which would be in effect for 3 years. The idea of deputizing local law enforcement agencies has long been controversial, with strong advocates on both ends of the debate holding firm to their beliefs on whether the program should or should not be put into place. SAALT, like many other immigrant advocates locally and nationwide, believes that 287(g) does in fact negatively impact the immigrant community at large. By deputizing law enforcement, we would essentially be creating a barrier between law enforcement and the communities they are sworn in to serve – an irony so obvious that I can’t seem to understand why some public officials are so adamant about putting the mandate into place. Consider this. New Jersey is not only home to a large, diverse, and emerging immigrant community, but also thrives economically because of the contributions of this very community, according to a report published earlier this year by Rutgers University. As an emerging community, however, coming from numerous cultural, linguistic, ethnic, and religious backgrounds, it’s important for us as public officials, advocates, service providers and community members to be mindful of the needs of our fellow community members. These needs could range from being aware of cultural and linguistic needs in accessing basic government and public services; navigation the school, medical, and legal systems; and addressing racial and religious discrimination targeted towards immigrant communities, often more vulnerable when they are unable to communicate because they are limited-English proficient (LEP), or because they are unaware of the proper channels available to them to report incidences and crimes of the sort. Additionally, many immigrants migrate from countries where the rule of law is often corrupt, making them fearful of approaching (or being approached by) law enforcement. 287(g) has been criticized by immigrant advocates for many justified reasons, one of the most disconcerting being that the mandate would allow for local law enforcement to essentially profile immigrant constituents in the process of making arrests based on ‘suspicion’. It will detract from their job of keeping the peace in local communities and protecting constituents by creating a sense of fear amongst the immigrant community of being rounded up by the police based on the color or their skin, or the accents in speech. Recently, New Jersey Attorney General Anne Milgram issued a strongly worded letter to Hudson, Morris, and Monmouth County officials warning them to not use 287(g) as a mechanism to racially profile constituents. Additionally, she made clear that the mandate does not allow for sweeps or ‘on-the-street-encounters’, where law enforcement uses round ups as a means to conduct immigration checks, and that any incidences of violating NJ laws will be dealt with by the AG’s office. All that aside, though, what does it really mean to be an immigrant in New Jersey, where 287(g) may tentatively be put into place? Imagine this. You are an immigrant mother of two. You speak limited English, and rely on your husband to deal with the intricacies of life outside of your home. You have been in this country for many years, and your children are enrolled in the local school system. Your husband sponsored you to migrate to this country when you first married. You find yourself in an abusive relationship, and consider reaching out to the police to intervene. However, your husband tells you that reporting him to the police will result in your deportation, that they’ll take away her children and she’ll never see them again. So, you weigh out the pros and cons, and somehow justify staying in a violent marriage for the sake of your children, and for the fear of being deported back to your country of origin, where you may face even more violence for leaving your husband. Somehow, the thought of daily violence isn’t as bad as the thought of approaching the police, the threat of deportation and separation from your children looming overhead. Imagine this. You are a second-generation immigrant. You are Muslim, with a very common first and last name. You are driving late at night on your way home, and you are pulled over because you are speeding. Along with your license and your registration, you are asked for your immigration papers – something you don’t carry around with you, because you are a legal resident and you tell them this much. You are asked to come to the station. You grudgingly comply, thinking of it as an inconvenience, but that you will be out as soon as they run your name through the system. Your name, a common one, shows up with some alarming news attached to it. You tell them it’s a mistake, and that you are in fact not that individual. You are detained for several hours, perhaps days, as they sort out the situation and realize that you are in fact not who they think you are. In the meantime, you are not allowed to make a call to family members or a lawyer, and no one knows of your whereabouts. You are told that this is normal procedure – a criminal until proven innocent. You are let out eventually, but with a bitter taste in your mouth in regards to local law enforcement. You know you will think twice about approaching them should a problem arise in the future, if only to avoid the painful and humiliating process they have just subject you to. Imagine hundreds of other scenarios that immigrant constituents will face should 287(g) go into affect. Imagine being racially profiled and being treated like a criminal. Imagine being fearful of the police when you need them most, when you are placed in a dangerous situation, but the fear (be it real or imagined) of being deported holds you back from calling for help. Is this the sort of community you want to be a part of? 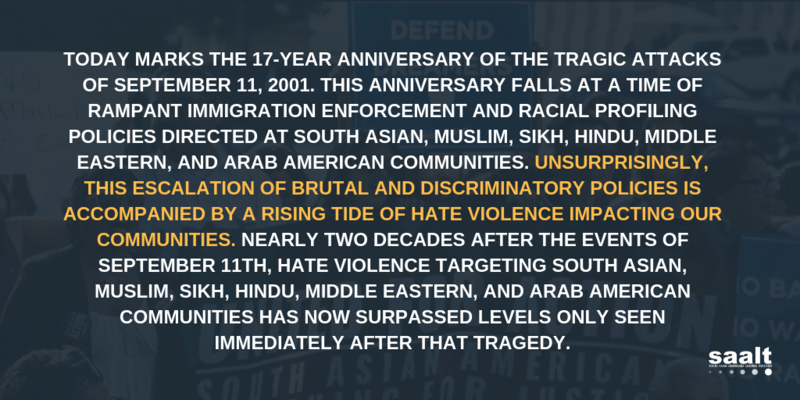 This post was previously published at the Asian Pacific Americans for Progress blog as part of the Asian Pacific American Week of Action on immigration reform. Before I started law school, I had definitely heard the term “due process.” I have to confess, though, I wasn’t really sure what it meant. All I knew is that it sounded good, seemed to be a core American value, and was rooted in fairness. It was something that this country prided itself on as a hallmark principle that came down from our Founding Fathers. When we talk about immigration, there is often talk about due process violations affecting the lives of immigrants, but what does that really mean? Of course, we could always turn to our trusted friend, the Webster’s Dictionary for some guidance: “legal proceedings that are carried out following established rules and laws that result in unfair or arbitrary treatment of individuals.” (The legal eagles among us can rely upon the definitive Black’s Law Dictionary for some fancier and technical language, too.) But these lofty and abstract definitions did not hold much traction for me. It wasn’t until I encountered the real life experiences of immigrants whose due process rights were violated that I understood why this value is so dear and needs to be protected in our country’s immigration system. Below are just a few examples spotlighting South Asians seeking asylum that made clear to what due process (or the lack thereof) truly means. Due process means access to legal representation and legal information: Monisha, originally from Pakistan, was an honors graduate from UC Berkeley who came from Mumbai to Texas to seek asylum with her parents and brother when she was ten years old. While in India, her father was very involved in the local Muslim community – as a result of his activities, thier family became the target of Hindu fundamentalist groups. They were denied asylum because their attorneys failed to meet necessary filing deadlines. Immigration authorites later arrested her parents and brother and placed them in deportation proceedings. Navigation the complex world of immigration law is often worse for those who do not have lawyers and have to represent themselves because immigrants facing deportation are not guaranteed an attorney. Does it seem fair that accurate legal information and competent representation is often unattainable particularly when the immigration system is so complicated? Due process means ensuring that immigrants are not criminalized and placed in detention: Harpal, a Sikh man, chose to be deported back to India where he had been tortured, rather than languish in limbo in immigration detention. When he arrived in the U.S., he settled in the Bay Area, began working as a truck driver, and applied for asylum. He was later arrested by U.S. government and immigration officials. After being detained for more than eight years in California, much of it in solitary confinement, and tired of waiting for Convention Against Torture claim to be resolved in the courts, he decided to return to a country where officials had previously mistreated him severely. Does it seem fair to lock up individuals for years who have committed no crime and are waiting excessive period of time for their immigration cases to be resolved? Due process means guaranteeing fairness of immigration court proceedings and case review on appeal: A Sri Lankan woman fleeing persecution in Sri Lanka was denied asylum by an immigration judge who did not believe her case simply because she was “looking up at the ceiling” during testimony. The judge ignored detailed evidence of her fear of return and based denial on this minor point about her demeanor. Even worse, the appellate body, the Board of Immigration Appeals, did not disagree with the judge’s ruling. It was not until a federal court reviewed her case that the initial judge was ordered to consider her case more thoroughly. Does it seem fair that the safety and lives of immigrants depend upon often arbitrary and unfair decisions that can occur in Immigration Courts and are given limited review? These are just a few stories that you find replicating themselves within the South Asian community that convey in real terms what the lack of due process looks like. As immigration reform moves forward, it is crucial that due process and fundamental fairness be restored to policies and procedures that affect the lives of so many immigrants in this country.